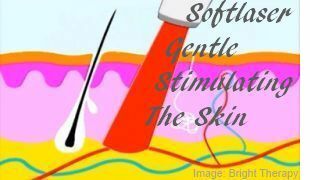 Skin Care Lasers For Home-Use - BrightTherapy & Tria Age-Defying Lasers. Instead of treatments in the doctor's office by medical professionals, people can now do skin treatments themself such as treating anti-aging, wrinkles, fine lines, acne, scars, stretch marks with an affordable home-use laser device from Tria Beauty, SkinCeuticals, Iluminage, what makes it very convenient for them to do it at home at times that suits them best. We're talking here about home-use skin rejuvenating laser devices. It works about the same as professional in-office treatments, also known as fractional non-ablative laser treatments. Low level laser beams accelerate collagen and elastin production in your skin resulting in fading wrinkles and lines. To get best results you need to stick to a strict treatment regime. Images or links below may lead to webpages for more information, or to Amazon where you can read through the reviews which is quite informative. From the U.K. or Canada? If there are matching products available in your country, the Amazon link will show it to you. Supplier of beauty and skin care products Tria Beauty, launched a laser light device to treat your skin. According to the company you can now visibly restore what they describe as the natural luminosity of your face. The device is in particular suitable for treating wrinkles. Tria Beauty USA indicates that treating your skin with their age-defying device will give results in about two weeks. This Tria Beauty skin rejuvenating laser operates on 1440nm wavelength, so it has a greater depth of penetration. You may also read about an adverse event report at the website of the U.S. Food and Drug Administration - FDA, of a complaint from a Tria Age-Defying Laser customer, experiencing darkening and dehydration of the skin. Report. Quite a few users had technical problems, especially with charging the laser or the charger didn't work properly. Or manual instructions for turning the device on may not be accurate. When you have problems with it, then contact TriaBeauty's customer service for the right instructions. Other users were not satisfied about the promised working of the device, such as experiencing no change in wrinkles or skin after using the device. Or some users only experience good results with smoothing the skin and for dark spots, but few results on wrinkles or sagging skin. All in all, some users are not satisfied with the product. Also mind that there are users who rate it as great, mainly did that because of other things than its working. For example for reasons such as: "easy to use", "great customer service" "not long enough used to evaluate"
On the other hand many users are satisfied with this laser but mind that it takes a while before you see results. - You may well control your rosacea, wrinkles and skin tone. - You may reduce sun damage redness. You need to stick to the treatment period, before seeing results. Here for more information, reviews and best pricing. Skinceuticals is now offering the Tria Age Defying Laser for home-use, together with Skinceuticals' antioxidant system to apply after using the laser. This antioxidant - also containing the ingredients Resveratrol B E and C E Ferulic may well reduce the redness and supporting skin repair. When buying this Skinceuticals laser/antioxidant combination, you may pay less than via Tria Beauty - see further down. See Amazon here for the Skinceuticals Laser. Nicely designed Skin Laser Iluminage to Reduce Fine Lines and Wrinkles. The laser treats your skin in a way that it generates new collagen fibers, just like professional lasers do. Like with other lasers for skin care it is important to stick to the treatment procedure. - First wash and dry your skin. - Determine the areas you want to treat on your face. - Place the device on your skin and led you guide by the lights and tones. - Apply a moisturizer after the treatment. See Amazon here for the iluminage skin smoothing laser. In general this eye wrinkle laser device works the same as the Tria device mentioned near the top of this article. The company stated that every day treatment may give results in a few weeks, but for best results you do the treatments for eight weeks. See Amazon here for the Eye Wrinkle Correction Laser. It's hard to tell if these laser products are a better alternative to LED light devices. See Amazon Here for more these home-use laser devices. In case you also want to do something about unwanted hair, you might see Here for Laser Hair Removal Devices. Here's Information about Led Light Therapy For Skin Devices.